Check out the latest Japan Crate Coupon on My Subscription Addiction! Japan Crate Coupon – FREE Hi-Chews with Subscription! Japan Crate Coupon – FREE Pokemon Figure with Subscription! Japan Crate Coupon – FREE Valentine’s Day Chocolates with Subscription! 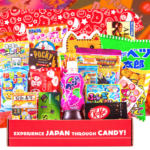 Japan Crate Coupon – FREE Kit Kats with Pre-Paid Subscription! Last Day! Japan Crates Black Friday Deal – FREE Pokeballs + Up to $40 Off Subscriptions! Japan Crates Black Friday Deal – FREE Pokeballs + Up to $40 Off Subscriptions! Doki Doki Black Friday Coupon – Free November Crate with Subscription! Japan Crate Coupon – FREE Pokemon Snacks with Pre-Paid Subscription! Japan Crate Coupon – $10 Off September 2017 Box! Doki Doki, Kira Kira, and Japan Crate on Sale at Groupon!